The epiglottis is a leaf-shaped elastic cartilage flap behind your tongue (epiglottis means “upon the tongue”), which bends down to cover the glottis (opening) of the larynx each time you swallow. The epiglottis is a flap of elastic cartilage that sits beneath the tongue at the back of the throat. Its main function is to close over the windpipe (trachea) while you’re eating, to prevent food entering your airways. The epiglottis stalk attaches anteriorly to the internal aspect of the angle of the thyroid cartilage (Figure 1). From there, the epiglottis projects superoposteriorly and attaches to the posterior aspect of the tongue. 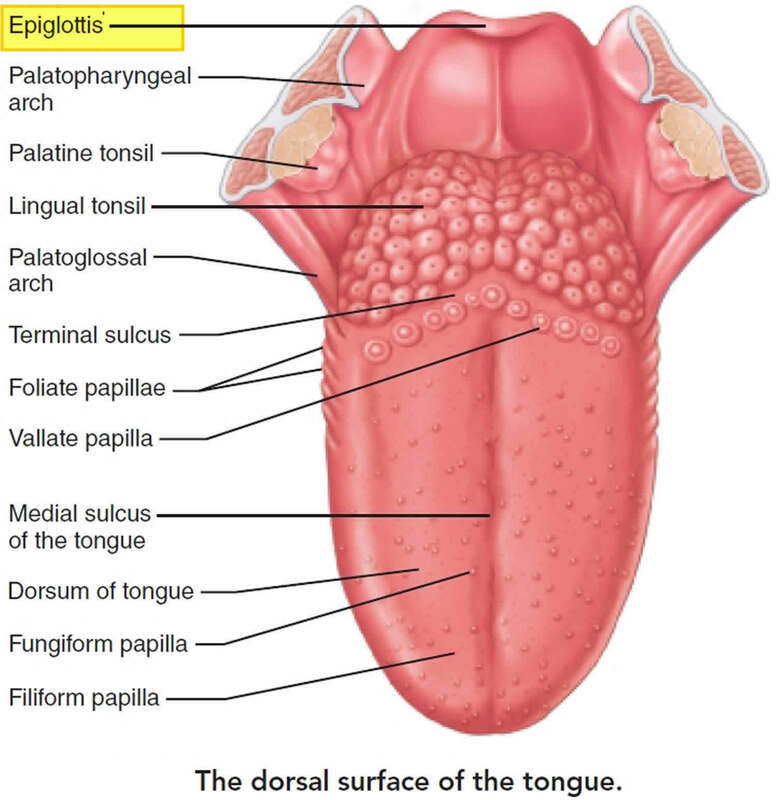 The epiglottis is located behind your tongue and it sits beneath the tongue at the back of the throat. During swallowing, the entire larynx is pulled superiorly and anteriorly by the suprahyoid muscles, and the epiglottis tips inferiorly to cover and seal the laryngeal inlet. This action keeps food out of the lower respiratory tubes — so that food is not inhaled into your lungs. The entry into the larynx of anything other than air initiates the cough reflex, which expels the substance and prevents it from continuing into the lungs. By pulling anteriorly on the hyoid bone, suprahyoid muscles also widen the pharynx to receive the food. The taste receptors occur in taste buds in the mucosa of the mouth and pharynx. The majority of the 10,000 or so taste buds are on the surface of the tongue; a few others occur on the epiglottis. The vagus nerve (cranial nerve 10) carries taste impulses from the few taste buds on the epiglottis and lower pharynx. Epiglottitis is a potentially life-threatening inflammation and swelling of the epiglottis with the potential risk of fatal airway obstruction – blocking the flow of air into your lungs (see Figures 1 to 4) 1). Epiglottitis is often caused by an infection, but can also sometimes occur as a result of a throat injury. Epiglottitis can be fatal if the throat becomes completely blocked. But most people make a full recovery with appropriate treatment. Acute epiglottitis is known to be potentially life-threatening because the special structure and anatomical location of the epiglottis (see Figures 1 to 4) make it prone to severe swelling (edema), which can lead to dyspnea (shortness of breath) and even suffocation, resulting in death 2). In most cases, acute epiglottitis is caused by infection. Effective management requires rapid diagnosis, airway management, and treatment of the causative agent. Epiglottitis is a medical emergency. If you or someone you know suddenly has trouble breathing and swallowing, call your local emergency number for an ambulance or go to the nearest hospital emergency department. Try to keep the person quiet and upright, because this position may make it easier to breathe. Don’t try to examine the person’s throat yourself. This can make matters worse. Epiglottitis is usually caused by epiglottis infection with Haemophilus influenzae type b (Hib) bacteria. As well as epiglottitis, Haemophilus influenzae type b (Hib) can cause a number of serious infections, such as pneumonia and meningitis. Haemophilus influenzae type b (Hib) spreads in the same way as the cold or flu virus. The Haemophilus influenzae type b (Hib) bacteria are in the tiny droplets of saliva and mucus propelled into the air when an infected person coughs or sneezes. You catch Haemophilus influenzae type b (Hib) infection by breathing in these droplets or, if the droplets have landed on a surface or object, by touching this surface and then touching your face or mouth. Children are particularly vulnerable to a Haemophilus influenzae type b (Hib) infection because they have an underdeveloped immune system. The most effective way to prevent your child getting epiglottitis is to make sure their vaccinations are up to date. Children are particularly vulnerable to a Haemophilus influenzae type b (Hib) infection, because they have an underdeveloped immune system. Children should receive their Haemophilus influenzae type b (Hib) as part of the 5 in 1 DTaP/IPV/Hib vaccine, which also protects against diphtheria, tetanus, whooping cough and polio. Immunization with the Haemophilus influenzae type b (Hib) vaccine is an effective way to prevent epiglottitis caused by Haemophilus influenzae type b (Hib). Children should receive three doses of the vaccine: one at two months, one when they are three months and one when they are four months old. This is followed by an additional Hib/Men C “booster” vaccine at 12 months. Possible mild side effects. These include redness, warmth, swelling or pain at the injection site, and a fever. Epiglottitis is treated in hospital! The first thing the medical team will do is secure the person’s airways to make sure they can breathe properly. An oxygen mask will be given to deliver highly concentrated oxygen to the person’s lungs. If this does not work, a tube will be placed in the person’s mouth and pushed past their epiglottis into the windpipe. The tube will be connected to an oxygen supply. In severe cases where there’s an urgent need to secure the airways, a small cut may be made in the neck at the front of the windpipe so a tube can be inserted. The tube is then connected to an oxygen supply.